It's Halloween! As you probably have noticed, we're a bit fond of pirates around here. KC loved the fact that her costume from last year still fit. She did find a new sword and hat while on our retreat. Thursday morning as we left town the girls noticed a Jolly Roger in the sky. (Check it out, it was really cool!) Avast ye mateys. There be pirates in the sky! 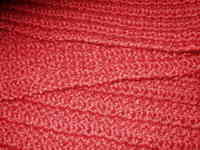 Seeing all of this red reminds me that this weekend we did manage to take care of some Red Scarf Project knitting. Fairy Godmother finished a scarf and I added two more (shown her with 3-D's first hat project). That makes 3 completed scarves ready for January's shipment. Next up, Christmas knitting. Time to make a list and check it twice! 3-D had struggled in the past knitting scarves with the English method. She crochets with ease, so for the first lesson we tackled Continental knitting. She took to it like a loon to water. (We were in the northern woods afterall.) Friday evening she learned Continental, got gauge, and started the ribbing for her first project; a striped hat. Saturday's Second Lesson: switching colors and "trapping" her tails. Her fingers cruised! 3-D was on a mission to finish the hat before it was time for all of us to leave. A sure sign that she's got the same gene most knitters seem to possess; setting goals that may on the surface seem unrealistic. (It's got to be a gene; how else can it be explained!?!) She also has another trait that most knitters possess: a healthy sense of humor. Saturday evening we had a roaring fire going and were listening to rap music, yes rap music. (Hey, I was surrounded by young people with Ipods!) Out came the goofy clothes and sunglasses and the next thing I knew we were all "gangsta knitting"! The rap music inspired Panda to finish the first of her fingerless gloves. She wanted a pair to match her pirate hat. You go Girl! Sunday morning came and 3-D was far enough to tackle a lesson in decreases. In the end, she did a fabulous job...she finished her hat before getting dressed for the day. (I told you she had the same genetic code that so many of us possess!!!! Don't even TRY to tell me that you've never knit in your old, comfy pajamas!) She had another goal this past weekend...to make it onto the blog. Now she's accomplished both goals AND she went back to the Nordic shop to get more yarn. Good Girl....now we all know why she's known as the 3rd Daughter!!! Keep it up, Kiddo! Road trips...the eight hour kind...are perfect for two things; knitting and geocaching. When we left on Thursday, I started the first sleeve for the baby sweater. In the past, a long road trip meant endless, mindless hours for the kids...sleeping, reading, movies. 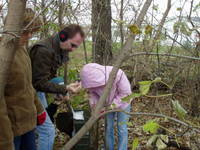 But now that we are geocaching, it also means a chance to check out places along the way. A chance for us all to get out of the car and stretch our legs. Notice the smiles. Sure, stopping to cache added an hour to our trip, but in the end, though it took longer, the time seemed to go by faster! Over the next couple of days I'll share the knitting that was accomplished by all of us while on retreat. But since Sundays are for geocaching, the only other knitting that I'll share with you is from the trip home; the second baby sleeve. One sleeve up, one sleeve down. One GREAT weekend, all around! Whoopers (not whoppers)...as in Whooping cranes. Two of the organizations that I am involved in through work happen to be the International Crane Foundation and Operation Migration. Both are involved with the reintroduction project of Whooping cranes in the US. At this moment in time there are 18 whooping cranes who are being "taught" their migation route to Florida by following ultralights. If you've ever seen the movie Fly Away Home you'll know what I'm talking about (and if you haven't seen the movie...check it out). The movie is based on the true story of Bill Lishman who is one of the founders of Operation Migration. This is the sixth year of teaching young cranes to fly south for the winter. It only takes one trip and they've learned the route for life! This year was the first year that previous "graduates" hatched young that they will teach the route without human assistance. In a few more years, hopefully, these fall ultralight training flights will no longer be needed once the species has reestablished itself. In the meantime, it takes $206 to fund each mile of their journey. If you have the means to do so, please join my family in becoming a Mile Maker (or a 1/2 mile or 1/4 mile). 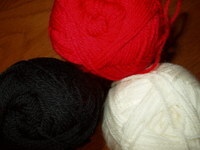 It may be too late for this year, but I picked up some yarn to use to design some "crane socks". Once I finish the design work, I'll post the information for ordering and the funds will go to Operation Migration. In the meantime, you can follow this year's "class of 2006" cranes on their flight to Florida by reading the Field Journal. It IS addicting and the photo albums are often spectacular! Enjoy!!! This weekend a new exhibit opens at the University of Wisconsin Design Gallery called "New School Knitting: The Influence of Elizabeth Zimmermann and Schoolhouse Press. The exhibit runs from October 27- December 17th. There will be knitting classes, open sessions AND this Sunday, October 29th there is an opening reception from 1-4PM including a question and answer period with Meg Swanson. Unfortunately, we will be on our way home from our "retreat" on Sunday and nowhere near Madison, WI for the opening reception. But a trip to the Design Gallery between now and December 17th is now definitely in my future! Speaking of futures, if you've heard others talk about Knitting Camp, now's your chance to start planning for next summer. The new 2007 camp schedule is up. If interested, contact Schoolhouse Press to get on the mailing list. I didn't go this past summer but am considering it for 2007. How about you? Anyone else planning on it? If so, which camp session? I'm seeing red! After days and days of I/nfernal R/esearch S/preasheets who wouldn't be. But I finished this evening so that we can run away for the weekend. The kids have teacher's convention break and we are hitting the road. 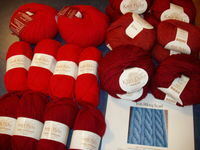 Just in time, there is plenty of red to be made up for the Red Scarf Project. There will be a couple extra knitters at this retreat who would like to learn to cable. I think this project will be a good chance for them to practice. I'll be using the Irish Hiking Scarf pattern to teach the technique. Hopefully, I'll have scarves to share with you on Sunday or Monday. Any guesses as to how many there will be? Sorry guys...the I/R/S has hit our office with a huge project. Unfortunately, that means bringing my work home with me. Thankfully, there still are 20 minutes of knitting time while waiting for my youngest to get out of school. Easy, mindless knitting. I've started my first Red Scarf Project scarf. I'm using the pattern that Harlot posted last week. Easy, mindless knitting. Not even a sock could beat this easy, mindless knitting. I/R/S: Idiosyncratic Research Spreadsheets. Time to get back to them. I'd rather be dealing with I/R/S: Initial Red Scarf! Back to our regular programming tomorrow. As has become the habit, Sundays are made for a drive and a bit of geocaching. Today, we headed an hour west, picked up my cousin and searched in her community. We had been worried that we wouldn't get out today. Originally, the forecast had been for rain and snow but instead we had sunshine and COLD. Mittens were in great demand! At one point KC's mitten landed on the other side of a fence! [She'd been climbing (what else!?!) to get a better view of the lime covered pond.] Panda found a BIG STICK and went "fishing". Thankfully, she "landed" it and her sister was quite grateful. (How often to most parents here one sibling thank another profusely!?!) "Cuz" borrowed one of my mittens and later mentioned that today was just the incentive she needed to finish knitting her second mitten. It seems that mittens suffer from the same syndrome as second socks. In the end, we found seven new caches, stopped at an apple orchard, took the dog along for several LONG walks, visited with my cousin, aunt, and uncle, and laughed. A good day was had by all! Shaun the Sheep welcomed us back into the car for a bit of knitting on the drive home. This week, baby sweater needs somes sleeves. Halloween is still more than a week away, but have you also noticed a fair amount of tricks and treats already? Take Coach's socks for instance. They are finished, well almost finished. 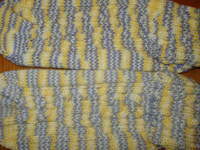 The knitting is finished; the tails need to be sewn in. Time Progress seems to stop slow when I make the switch to ONE needle. Are my eyes playing tricks on me or are the blue stripes drastically minutely different? Go ahead, double click on the picture and judge from yourself. But it appears to me that the blue on the top sock is slightly darker than the one on the bottom. I even checked on the label and they are both from the same dye lot. Thankfully Coach will probably never notice it. Trick or treat? Have you checked out the Knitty "bonus" that arrived this week? First there was Hallowig, then there was the Leia wig, but Desparate Housefrau!?! What's up with this? Furthermore, it hit my e-mailbox on Thursday and there doesn't seem to be any discussion in the blogosphere about it. I can't believe that no one is even talking about this thing. First, I like Hallowig and Leia, but I can't EVER see knitting this for ANY reason. Astor clearly has a whimsical take on life. (Notice she even came up with Yoda wig.) I guess whimsy was running on low this week. With the past two crazy weeks behind me, this weekend begins the opportunity for my whimsy to return. A little cleaning, a little trip to a haunted house, maybe a pumpkin farm and a little bit of time with a baby (sweater). Time for treats. First, Knit Some Holiday Cheer, for those of us who have started our Christmas knitting but are afraid to blog about it at our own sites. 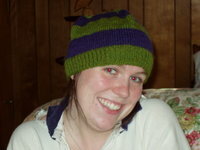 Alison is hosting the site so that anyone who'd like to blog about their Holiday knitting can do so. She also has provided a sidebar where the number of items completed can be kept track of. I need to sign up, but first I need to rethink my holiday knitting. My "rough list" would have meant TEN solid days of knitting over the next month! Solid, as in 24 hour days. Guess I'll have to "trim" my list a bit. BUT...I know a few people who would get a kick out of receiving an environmentally-friendly Swiffer cover. Not that I condone housekeeping items for holiday gifts, but they are unique! While on the subject of holidays...Halloween is less than 2 weeks away. Not sure about a haunted house...you can find one here. Keeping with the holiday theme...Lavender has special holiday sock yarn in her Etsy store. 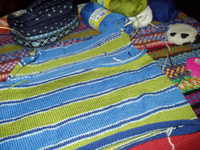 KC is particularly fond of the Hanukkah yarn because blue and white are her school colors AND she loves in her Independance Day socks made from Lavender's yarn. One of my favorite teas, Bengal Spice, is no longer available locally. 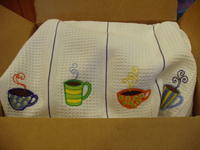 So I ordered some and have now wrapped a box along with some other surprises for my Knitters Tea Swap 2 pal. The package was supposed to go out by the 15th, but I was still waiting for the Bengal Spice. As soon as she receives it I'll post. In the meantime, Christmas is coming!